The exact date of the discovery of the Madrid image is unknown, although it is known that it began when Spanish friars were traveling through the village of Traigueras on their way to Rome to gain approval for the Order of Minims, founded by St. Francis of Paola (1416-1507). When a furious storm descended upon them, they prayed for God’s guidance and help. Looking for shelter, they saw a mysterious light coming from a cave. They hurried to it and found the beautiful statue of the Virgin Mary holding the Child Jesus. Surrounding it was a shimmering light and a heavenly fragrance of flowers. When nobody in Traigueras knew anything about the statue and did not claim it, the friars carried it with them to Rome. On arriving there, they met with Pope Paul V (1605-1621), who heard the story of the discovery – and not only venerated and blessed the statue, but also gratified the friars by granting full approval of their new Order of Minims. The image was first placed in the Royal Hospital of Madrid where many miracles were granted. In fact, there were so many miracles that King Philip III ordered the construction of the Sanctuary of the Puerto del Sol where the image is found today, beautifully adorned and sumptuously enthroned. 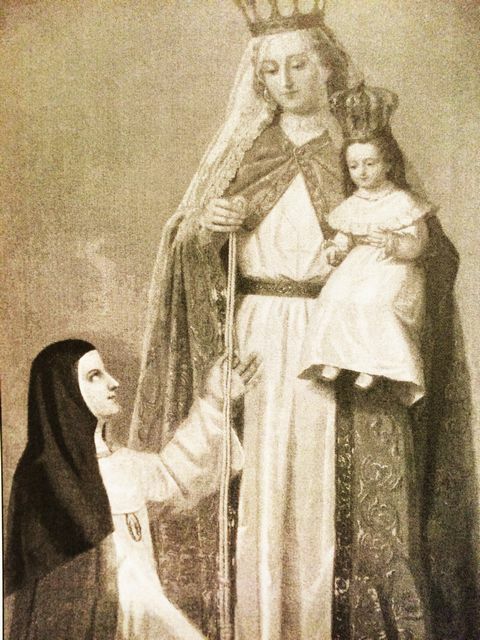 The image of “Our Lady of Good Success” in Madrid was dear to the hearts of countless souls, including Sister Mariana of Jesus Torres, who, even as a child, received visits from the Blessed Mother. After joining the Order of the Immaculate Conception, Sister Mariana was sent from Spain to Quito, Ecuador to found another house of the Order — of which she became the Abbess. Her great devotion to Our Lady under this title was continued when she arrived in Quito, Ecuador. It was there in Quito, on February 2, 1610, while she was praying to the Blessed Mother, that she was granted another heavenly visitation. Identifying herself as “Mary of Good Success,” the Virgin Mary asked that a statue be made to her likeness for the consolation and preservation of the convent – and for those faithful souls who would pray to her. The Virgin asks to be measured for a statue that will be crafted by angels. The painted wooden statue of Mary and Jesus, completed by the archangels. The three Archangels lifted the crown of the Queen of Heaven while she was placing the end of the cord on her head. But the cord was too short to reach to the ground. But the Child Jesus reached out from his Mother’s arms and miraculously stretched it to reach. Then Mother Mariana came out of her ecstasy and now had the exact measurements for the statue. On February 5, 1610, she contacted a Spanish sculptor, Francisco del Castillo, and honored him with this special project that would be due for consecration on February 2, 1611. The bishop routinely inspected the work going on in the choir loft. On January 10, 1611, he noted that the statue only needed a final coat of paint before completion. The sculptor indicated that he must travel far to Pasto, Colombia to get the fine paints required, and so he left town. At midnight, the first hour of January 16 (the day the sculptor was to return), Mother Mariana witnessed the choir loft and entire church illuminated with a supernatural light. The tabernacle opened by itself, and the three archangels, Michael, Gabriel, and Raphael, placed themselves before the throne of God — and something was given to them. Choirs of angels united their voices in singing, “Blessed Mary, temple and tabernacle of the Blessed Trinity.” In the next instant, Mother Mariana saw the three archangels in the choir loft, illuminating the statue with their divine light. St. Francis of Assisi appeared and joined the three archangels as they approached the unfinished statue. The statue was transformed so rapidly that Mother Mariana could not perceive how it happened. St. Francis took the cord from around his waist and placed it around the statue’s waist. Then he and the archangels disappeared as the Blessed Virgin appeared and entered the statue herself while angels continued to sing the Latin hymn, Salva Sancta Parens. At 3:30 a.m. Mother Mariana came out of her ecstasy and saw the statue still illuminated by Divine Light. When all of the convent sisters came to see the miraculous completion of the statue, they heard the angels still singing and saw the supernatural light still present. Later that day, when the sculptor returned, the nuns watched quietly as he approached the choir loft. As he approached the statue, he dropped to his knees and cried out, “This exquisite statue is not my work!” He wept as he realized that a miracle had been performed. He immediately composed a written statement testifying to the beautiful changes in the sculpting and painting that “were not of my hands.” The bishop was notified, and he, too, knelt and wept before the beautiful masterpiece, verifying the miraculous changes performed by angels that had completed the wooden statue in the sculptor’s absence. 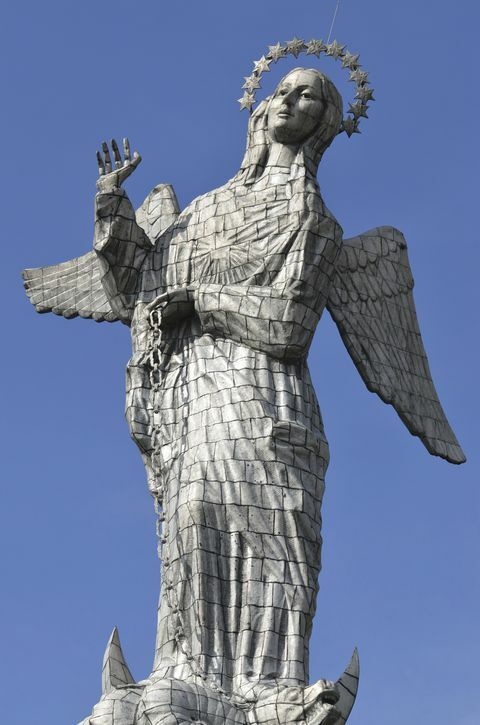 The large statue high above the church in Quito, Ecuador. Many other prophecies were given which depict the future as being very troublesome for the Church. 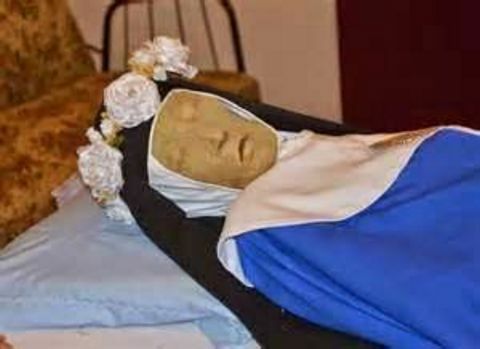 The incorrupt, non-decaying body of Mother Mariana after almost 400 years. 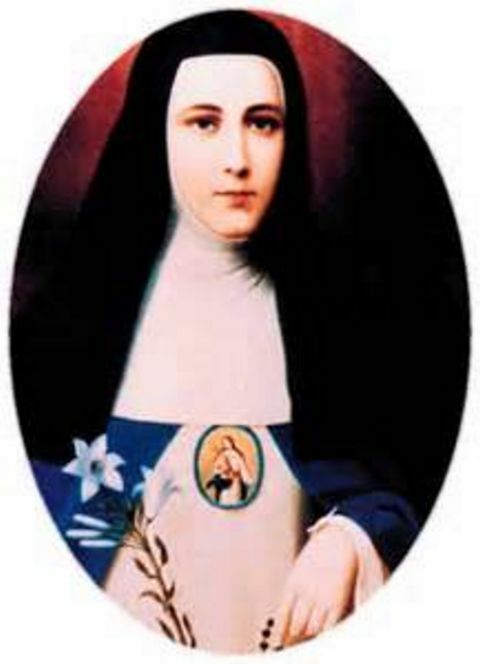 Mother Mariana of Jesus Torres died on January 16, 1635, after receiving the Holy Eucharist and the Sacraments of the Church. After three hundred years, in 1906, when the church was being remodeled, her tomb was opened. They were stunned to find her body perfectly intact with no decay after three hundred years! This divinely incorrupt body is now kept in a small chapel in the lower level of the cloistered convent. Her Cause for beatification was opened on the diocesan level by the local bishop. At the conclusion of the investigation of her heroic virtues, she was given the title, Servant of God. At the request of Blessed Mary, her statue was placed above the Abbess’ chair in the upper choir of the convent because she desired to be Abbess of the convent “until the end of time.” Unlike the statue in Madrid which depicts the Baby Jesus on the left arm, while the right hand of the Virgin holds a queenly scepter. 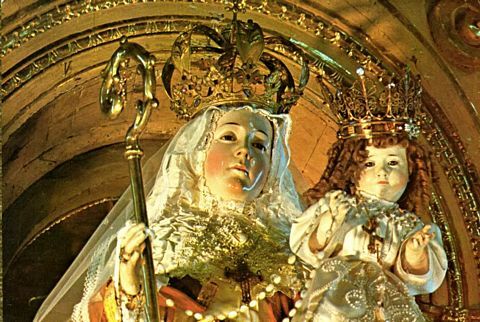 The statue in Quito also has the Baby Jesus on the left arm, while the right hand holds a crosier and the keys of the convent – not a royal scepter. The crosier denotes her authority as Abbess.